Managing any big commercial or industrial unit is not that easy, and lighting is that task, which you need to take care of properly as lacking in it can result in lower production and inefficiency among the employees. If the height of the ceiling at your commercial or industrial unit is more than the standard height. You can install UFO LED High Bay Lights that have premium designed LED chips embedded inside them that attain maximum operational efficiency. 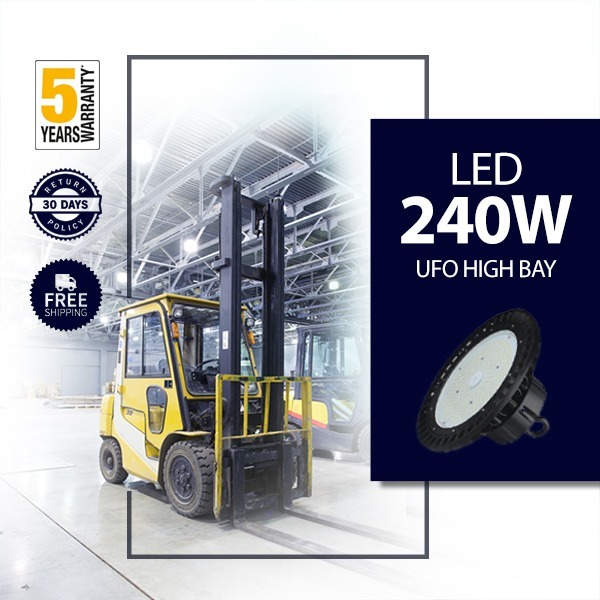 Among various types of high bay lights, you can use 240W LED UFO High Bay lights at the places where the ceiling height ranges between 20fts-30fts. 1. The lumen output of these 240W UFO LED High Bay Lights is 31231 lumens and the color temperature is 4000k. 2. You can replace 550W MH fixture with these high bays to make more energy savings of 310W per fixture if changed with this particular light. 3. You will get 50,000 hours lifespan of these lights which is much better than the traditional form of lights. 4. You can easily install the fixture with hook-mounted or ceiling mounted method on the ceiling of the warehouse and these lights have no variable cost attached to them. 5. Comes with a dimming option and you can adjust the level of brightness from 0V to 10V. 6. Also, the wider beam angle of more than 120 Degree is useful to illuminate bigger and wider places. 7. You can also choose motion sensor lights that come as an accessory and can be useful as it will notify you about the intruder who might be trying to enter your property. So install these DLC approved UFO LED High Bay Lights that will give you rebates and incentive from the power companies as well.